The Federal Housing Administration (FHA) is allowing borrowers who went through a bankruptcy, foreclosure, deed-in-lieu, or short sale to reenter the market in as little as 12 months, according to a mortgage letter released Friday. Borrowers who experienced a foreclosure must wait at least three years before getting a chance to get approved for an FHA loan, but with the new guideline, certain borrowers who lost their home as a result of an economic hardship may be considered even earlier. In order to be eligible for the more lenient approval process, provided documents must show “certain credit impairments” were from loss of employment or loss of income that was beyond the borrower’s control. The lender also needs to verify the income loss was at least 20 percent for a period lasting for at least six months. Additionally, borrowers must demonstrate they have fully recovered from the event that caused the hardship and complete housing counseling. According to the letter, recovery from an economic event involves reestablishing “satisfactory credit” for at least 12 months. Criteria for satisfactory credit include 12 months of good payment history on payments such as a mortgage, rent, or credit account. A recent survey conducted by FindLaw.com a legal information website found that 60% of Americans believe that it is “never OK” for homeowners to simply stop making payments on their mortgages. 34% say it’s OK for homeowners to walk away from mortgages, but only if they aren’t able to make the monthly payments. Only 3% believe that homeowners should be able to walk away from their mortgage anytime they want. Before making any major decisions, homeowners should consult with financial and legal professionals, including accountants, real estate attorneys and financial advisors. Any major change to a mortgage situation could lead to serious and unanticipated consequences involving taxes, contract law, credit scores, ability to borrow in the future, potential for lawsuits and much more. There are some tax benefits in purchasing a home vs. renting. You should speak with a bona fide tax professional and have a tax professional run the numbers to find out what benefits you may qualify for. Home Mortgage Interest Deduction: At this time, the interest paid on a mortgage or mortgage of up to $1 million for a principal resident and/or second home is deductible as an itemized deduction. Home Equity Loan Deduction: Homeowners can borrow up to $100,000 against the equity in their home and deduct the interest as an itemized deduction. The money can be used for any purpose, such as paying off high-interest credit card debt. Credit card interest is not deductible. Property Tax Deduction: Homeowners also get to deduct from their federal income taxes the state and local property taxes they pay on their home. Deductible home buying expenses: Various closing costs ordinarily involved in a home purchase are also deductible as itemized deductions, including points, prorated interest and taxes. $250,000/$500,000 home-sale exclusion: Perhaps the greatest tax benefit of owning a home comes when a person sells it at a profit. Homeowners who lived in their home for two of the prior five years prior to its sale need pay no income tax on a substantial amount of their profit – $250,000 for single homeowner’s and $500,000 for married homeowners who file jointly. This exclusion can be used once every 24 months. 14 days of free rental income: Another little known tax benefit of owning a home is that the owner can rent it out for up to 14 days during the year and pay no tax at all on the rental income. Home Office deduction: The only tax benefit that a renter can qualify for by virtue of being a renter is the home office deduction. This is a business deduction available to renters who own a business and have a home office they use regularly and exclusively for business purposes. Of course, the value of the tax benefits of buying a home depends on the state the buyer live in and their tax bracket. Buyers who live in high tax states like New York or California get the most benefit. 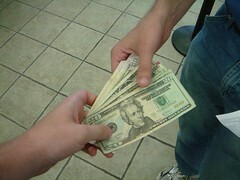 Americans have a renewed interest in all things frugal during this recession. They’re spending less money, using credit cards less. About ½ of Americans report they either avoid shopping altogether or shop only for those things that are absolutely needed, according to a survey sponsored by Citi. 72% of Americans say they have cut back on everyday expenses. In addition, 80% claim to have at least a plan for income and expenses, up from 47% in 2006, according to a survey by Synovate commissioned by personal finance author Matt Bell. Since consumer debt peaked in 2008, Americans have chopped $922 million from their debt, or 7.4%, according to the Federal Reserve. Americans are reducing debt at a pace unseen in at least a decade, according to a recent Fed report. How do we make these changes? Change your words – instead of a temporary exercise in deprivation, view it as a lifestyle. Track Progress – Monitor your debts and vacation accounts. When you see that spending smart is getting you closer to accomplishing your goal, that’ll motivate you to keep going. Make savings automatic – The easiest way to save is to have your savings deposited automatically from your paycheck to a savings or retirement plan. Make a windfall rule – When you receive a sudden increase of cash (i.e. tax refund, bonus, gift); make it a rule that these are used to paying off high-interest debt or savings. Effective January 1, 2011, California first trust deed mortgage holders who consent to a short sale of residential property (up to 4 units) are prohibited from seeking a deficiency judgment for the difference between the mortgage balance and proceeds realized through the sale. Senate Bill931 was passed by legistature in August and approved by the Governor on 9/30/10 to help strapped homeowners. So you have decided to purchase a home and have reviewed a copy of your credit report. You have noticed that you have some items that you need credit repair to remove from your credit report. I would strongly recommend using a credit repair company that you have previously used or have been referred to by either a loan officer or someone who has previously used a credit repair agency. The following information was furnished by the Federal Trade Commission. 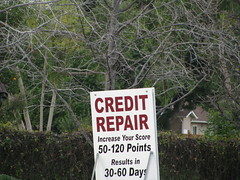 The company wants you to pay for credit repair services before providing any services. Under the Credit Repair Organizations Act, credit repair companies cannot require you to pay until they have completed the services they have promised. The company doesn’t tell you your rights and what you can do yourself for free. The company recommends that you DO NOT contact the three national credit report companies directly. The company tells you they can get rid of most or all of the negative credit information in your credit report, even if it is accurate. The company suggests that you try to invent a “new” credit identity and then, a new credit report by applying for an Employer Idenification Number to use instead of your Social Security Number. The company advises you to dispute all of the information in your credit report, regardless of its accuracy or timelines. A lot of people are trying to save money for their Retirement years and have questions concerning how to go about saving and paying off their debts to prepare for retirement. If you are heavily in debit, he would not encourage anyone to go into bankruptcy proceedings if he or she can help it. It creates a lot of stress and is not the best for your self-esteem. If you have multiple credit cards to payoff, I would begin paying off the credit cards, starting with the smallest one first, until they are all gone for good. It may be painful at first, buy you will increase your cash flow over time by eliminating the monthly payments.